Geeignet für alle Messer mit geradem Schliff. Nicht geeignet für Messer mit Wellenschliff. Auch Qualitätsmesser müssen regelmäßig nachgeschärft werden, das ist völlig normal. Der Umgang mit dem Wetzstahl erfordert etwas Erfahrung, daher ist für Ungeübte ein Messerschärfer eine gute Alternative. Die WMF Messerschärfer arbeiten nach dem neuesten Stand der Technik. Sie verfügen über Führschienen, die das Abrutschen der Klinge während des Schleifvorgangs verhindern. Zwei Keramikscheiben, die sich bei einigen Modellen stufenweise verstellen lassen, ermöglichen ein präzises Schärfen. Die stabile Bauweise der WMF Messerschärfer sowie ihre Anti-Rutsch-Beschichtung auf der Unterseite ermöglichen Ihnen ein hohes Maß an Sicherheit. Je nach persönlichem Geschmack haben Sie die Wahl zwischen verschiedenen Designs und Funktionsmerkmalen der Messerschärfer. A knife sharpener from WMF allows you to sharpen your high-quality knives in seconds, making every cut an impressive experience! Even the best knives need to be given a new sharp edge every now and then. It's completely normal and does not say anything about the materials or the quality of a knife. On the contrary, the fact that knives can be sharpened again and again means they last longer, which is good news for your wallet! With WMF knife sharpeners, you can get a sharp edge in just a few seconds. This means you can delight in the long-lasting exceptional sharpness of your kitchen knives, without having to make too much effort. Our knife sharpeners are manufactured using the latest techniques, and combine modern aspects with traditional values. We attach particular importance to the stability of WMF knife sharpeners, ensuring the greatest possible safety for the user. Knife sharpeners from WMF have two adjustable ceramic discs, which can be adjusted separately so you can resharpen blades as desired. Of course, our knife sharpeners also have guides for the knife and a non-slip coating on the base. With manual knife sharpeners, it is the movement of your hand alone which sharpens the blade. The guides ensure that the knife can move perfectly between the ceramic discs. Your other hand is used to press the knife sharpener down onto the table, so that it doesn't fall and is stable. When selecting a knife sharpener from our online shop, you can choose between different designs and methods. We also offer high-quality whetstones, which are ideal for sharpening Damasteel. All WMF knife sharpeners are manufactured according to the highest standards of quality, ensuring you will be happy with your knife sharpener for many years to come. The best place to store your knife sharpener is in a closed drawer. This keeps the knife guides free from dust and crumbs, which is important for achieving the best sharpening results.  In addition, WMF also offers a wide range of exceptional steels, the ideal partners for our knife sharpeners. Be impressed by the high-quality knife sharpeners from WMF and browse through our many offers!